Due to the simplicity of using Resin Bonded Gravel we can virtually eliminate any mess and disruption usually asscociated with driveway works. No skips necessary! 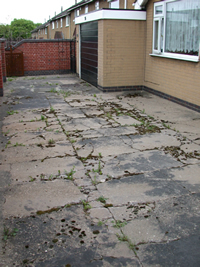 No need to remove existing concrete and tarmac. We use your existing as a base. Dpc levels, manholes and drainage channels are not affected due to the fact that Resin Bonded Gravel only has a 5mm depth. Our Resin Bonded Gravel is an extremely tough product – approved – for use on roads so well above any driveway specification and use. The original concrete surface for this job was extremely poor – very broken concrete – but look at it after. Our special prepartory waterproof mortar infills the cracks and weeds. This enables the application of Resin. What a difference our Resin Bonded Gravel makes. 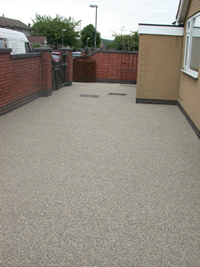 The Resin Bonded Gravel provides an impermeable surface. This prevents the ingress of water which over the winter time can make your unprotected concrete susceptible to the freeze/thaw effect. It also prevents weed growth and eliminates maintenance. Give us a call or email us using our contact form. See how we can help you.